I pride myself on being reasonably well versed in the Mediterranean history. After all, I am a proud holder of a university degree in Mediterranean culture. While completely useless in real life, the course included pretty extensive study of the past events in the relevant areas. 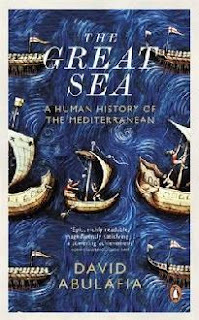 That explains my smugness when, browsing the history section in my library, I chose David Abulafia's The Great Sea to accompany me home. Smugness as in: 'C'mon. Tell me something I don't know'. I got my wish. Abulafia 'told' me many things I had been previously unaware of and my smugness evaporated sometime before the chapter three. Fair enough. I enjoy having my ego punctured if the puncturer is talking any sense. Some of the gaps in my education stem from the fact that I left the university in 2006. Lots of new research has been conducted in my field since then, plenty of new material evidence has been brought to the surface (in some cases, e.g. wrecks of Minoian sea-going vessels, the statement can be taken literally). Seen in this way, The Great Sea was a valuable refresher course, as it is pretty up to date. Seen in any other light, it still remains a very good book about history of the Mediterranean Sea. 'Sea' is the keyword here. It may seem obvious, but most of history books of that type focus on the broader Mediterranean region rather than the body of water between Europe and Africa itself. Sure, you cannot write a history of the sea without mentioning what's happening on its shores, but Abulafia is more disciplined than most in limiting his story to port cities and marine traffic. Chronologically, the book starts as far back as 22,000 BC and goes all the way to 2010, which pretty much equals the sum of our knowledge of history of the region. Each major civilisation that thrived on the Mediterranean shores is given its due. Abulafia divides this massive amount of time into five periods and those, in turn, are dissected into chapters along the geographic/ethnic lines. Despite the subtitle A Human History of the Mediterranean, the main (and recurrent) motifs in the book are trade and war. Still, both have been dramatically influencing human existence since time immemorial, so I guess the phrase is fitting. I found The Great Sea slightly monotonous towards the end, but this might be due to my own preference for ancient history. Otherwise, it's as readable a historical narrative as it is possible to get.